Killer whales are at the center of a broiling SeaWorld controversy, thanks to "Blackfish the Movie," which shed light on how the iconic mammals are treated in captivity. Many are boycotting SeaWorld parks. Animal rights advocates have arranged on-site protests, and several entertainers have canceled shows in opposition to SeaWorld's captive killer whale programs. SeaWorld's shows go on, however, the park insisting that its orcas are ambassadors who foster appreciation of the ocean and critters. But this week off Los Angeles, four wild killer whales proved emphatically that the most spectacular shows are those performed willingly in the wild, and that fishy treats are not required for them to leap and splash. Alisa Schulman-Janiger, a killer whale researcher, and Eric Martin, a marine biologist, on Monday afternoon were witness to a spectacle they'll never forget. "It was like SeaWorld without the tanks," joked Martin, co-director of the Roundhouse Marine Studies Lab and Aquarium at the end of Manhattan Beach Pier. The encounter began nine miles west of Redondo Beach, with what Schulman-Janiger described as "a chorus line greeting," and ended an hour later a bit farther to the north. The killer whales breached and spyhopped, surfed wakes created by the moving boat, and played beneath the vessel. They even killed a smaller mammal–most likely a common dolphin–and celebrated with more acrobatics. 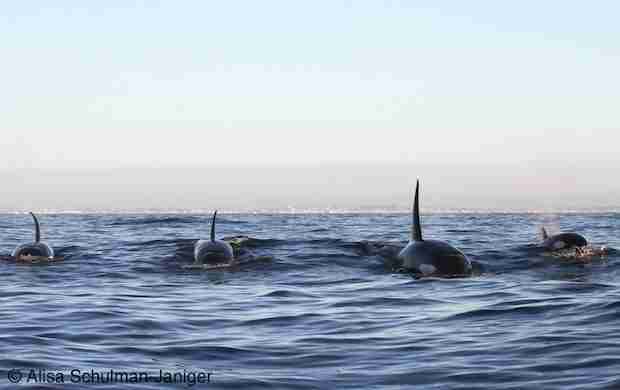 The orcas are family members that include the matriarch cataloged by Schulman-Janiger as CA51 (age unknown), a 15-year-old male (CA51B), a 10-year-old male (CA51C), and a 3-year-old female (CA51D), who is named Comet because of her unusual eye patches. CA51C has been nicknamed bumper because of his friendly belly-bumping of Martin's boat last December. 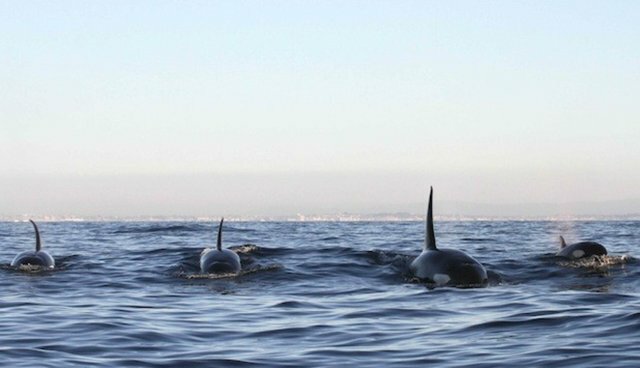 They're part of a group of transient killer whales known to be extremely boat friendly, and one that has recently begun to include Southern California as part of its range. 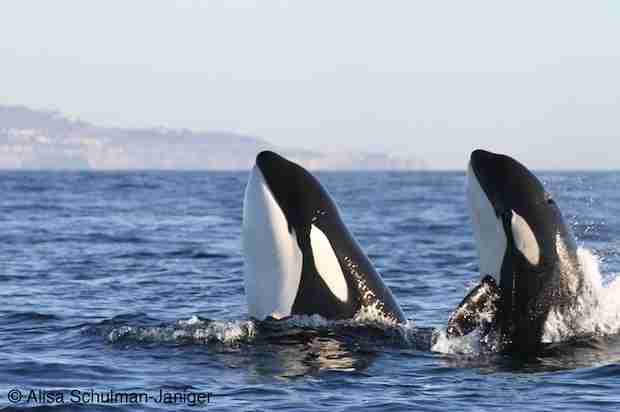 The group sometimes include CA51's 21-year-old daughter (CA51A), who has formed a separate sub-pod with her two offspring. 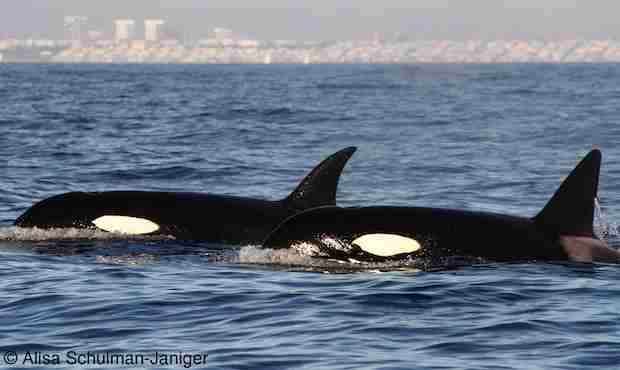 Monday's sighting was the fifth in four weeks of the CA51 group off the Los Angeles/Long Beach area. The sighting was first made by volunteers with the ACS-LA Gray Whale Census and Behavior Project at Point Vicente on the Palos Verdes Peninsula. That inspired Schulman-Janiger and Martin to embark on a search aboard his 18-foot boat. 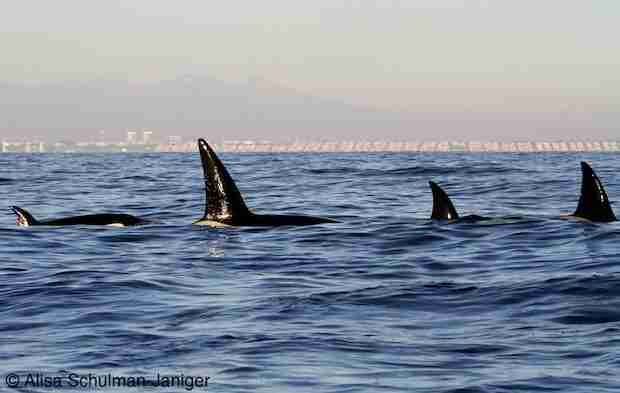 They spotted a tall, black dorsal fin at 3:07 p.m. and 13 minutes later they were surrounded by orcas. "They approached and came right at us and stopped all together," Schulman-Janiger said. "It was like a chorus-line greeting. They swam under and around our boat and poked their faces out of the water. They did this five or six times." 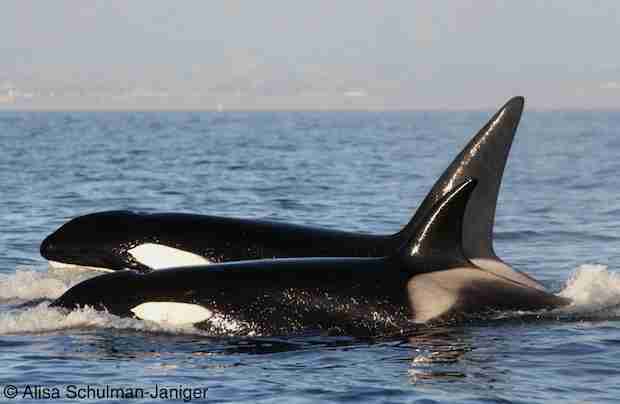 When Martin ran his boat the killer whales surfed in its wake, the largest male a mere inches from the transom. When the boat stopped, the mammals surrounded the boat and resumed playing around and beneath the vessel, occasionally poking their heads out of the water for a closer look at their visitors. Said Martin: "They were making eye contact with us, not just the boat. They were looking into our eyes, the way humans do. I don't see how it can get any better." Perhaps this act could be labeled, "Blackfish, Wild and Free."